Physicists at the Universitat Autonoma de Barcelona have designed and created in the laboratory the first experimental wormhole that can connect two regions of space magnetically. The tunnel transfers the magnetic field from one point to the other while keeping it undetectable. The researchers used metamaterials and metasurfaces to build the tunnel, so that the source magnetic field, such as a magnet or an electromagnet, appears at the other end of the wormhole as an isolated magnetic monopole. This result is strange enough in itself, as magnetic monopoles (magnets with only one pole, whether north or south) do not exist in nature. 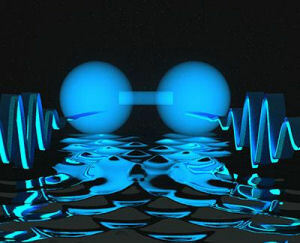 The overall effect is that of a magnetic field that appears to travel from one point to another through a dimension that lies outside the conventional three dimensions. The wormhole in the experiment is a sphere made of different layers: an external layer with a ferromagnetic surface, a second inner layer, made of superconducting material, and a ferromagnetic sheet rolled into a cylinder that crosses the sphere from one end to the other. The sphere is made in such a way as to be magnetically undetectable – invisible, in magnetic field terms – from the exterior. The magnetic wormhole is an analogy of gravitational ones, as it “changes the topology of space, as if the inner region has been magnetically erased from space”, explains Alvar Sanchez, the lead researcher. These same researchers had already built a magnetic fiber in 2014: a device capable of transporting the magnetic field from one end to the other. 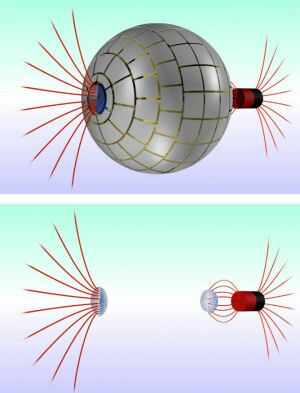 The breakthrough is a step forward towards possible applications in which magnetic fields are used, such as medicine. The technology could, for example, increase patients’ comfort by distancing them from the detectors when having MRI scans in hospital, or allow MRI images of different parts of the body to be obtained simultaneously.